Today we're relaunching our website. Most shops herald the technology they produce or the languages they're competent in on their website. While we're proud of the clients we server and the applications we produce, we're most proud of our people. You'll see that on this new website. We'll highlight the things we enjoy, other startups we're watching, or people we're helping. We're a people first technology company. With that being said, we're going to introduce you to every member of our team, one at a time on a weekly basis. We're asking each member the same 5 totally random questions. We're starting with Jared Malan, SC co-founder and partner in charge of product design. What was the last song you played on spotify / itunes radio / etc? Home by Edward Sharpe. I don’t really know what I lasted listen to last. I just said Home because I really like that song and think I’ll come off cooler for naming it. Share a screenshot of your phone's home screen. what app do you use the most? I like to keep my home screen minimal. Electronic Objects is the most interesting app. From it, I choose new art to hang in my home each day. You’ll notice, I don’t have email or Facebook or Instagram on my home screen or phone. I gave those apps up. My phone is a little less interesting to open, but I don't feel like one of Pavlov’s dogs anymore. 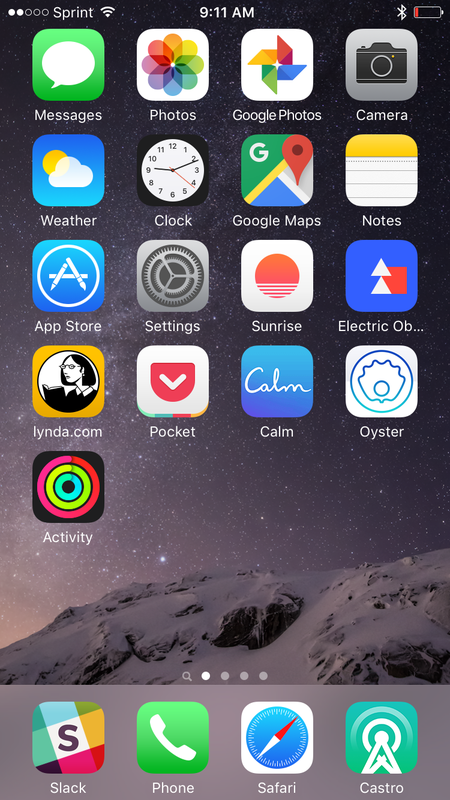 I am trying (with limited success) to replace time on those apps with long form reading through Oyster and Pocket. Castro (a podcast app) gets the most usage—which is why it is on the Dock. Definitely. But that word may come to mind first because I can’t spell it, which means I need to spell check it. Every. Time. Looking back on the last 20 years, what app or website or startup do you wish you had created? And why? Google. It has changed my life more than anything else. Think of how limiting life would be without it—even with the latest hardware. I find that I even use Google to locate files on the web that I have already stored and organized on my computer. I’d also like to be as rich and powerful as Sergey Brin and create a holding company like Alphabet.